If you want to keep up in real time, there are plenty of options. First is NBC's version of ESPN, a cable network sports affiliate dubbed NBCSN that will air over 230 hours of live coverage starting Saturday at 3 a.m. ET. There is also NBC's official website coverage at NBCOlympics.com. You can also catch NBC's coverage via the free NBC Sports Live Extra app for your iPhone/iPad, Android or Windows Phone mobile device. All these options, however, require you to actually have a basic cable subscription to authenticate the apps or watch online. There are a few choices for those without cable. First is buying an HD antenna. They're pretty cheap these days on Amazon ($40 for the Mohu Leaf.) However, like old school television watching, the programming won't be on demand and you'll have to be in front of TV at the right time. If you want to use what you already have, keep your laptop browser pointed at YouTube's official Winter Olympics page or NBC's official Winter Olympics YouTube page. If you want to follow on your phone or tablet, Team USA now has its own Road to Sochi app for iPhone and Android along with a Windows Phone version. For keeping tabs on the progress of all countries, you'll want to download the Sochi 2014 Results app for iPhone, Android or for Windows Phones. With these apps you can keep up on the latest news, scores and big events. NBC's official Winter Olympics social media accounts are blasting out the updates in full force. You can find them on Twitter, Facebook, Instagram and Vine. The Sochi Olympics committee also has an official presence on Twitter and Facebook while the International Olympics committee is updating their Twitter, Facebook and, wait for it, Tumblr accounts. Facebook has official pages for US Olympic team as well as the freestyle ski team, luge team and snowboarding team. If gratuitously filtered photos are your thing, Instagram has a Team USA page as well as pages for many of the venues such as Fisht Olympic Stadium where the opening and closing ceremonies will take place, Adler Arena for speed skating and Rosa Khutor Extreme Park for snowboarding and freestyle skiing events. However, if you are just searching for the social media presence for a specific athlete, the easiest way it find them on the official Olympics social directory or NPR's list of Twitter accounts for Olympians. In case you just scrolled to the end, the short version is: NBC primetime for time-delayed highlights; NBCSN cable network for continuous coverage; YouTube, official websites and social media for immediate updates; and apps for news and highlights on the go. 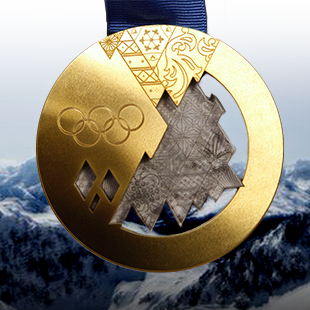 Now, go forth and take in the non-stop Winter Olympic goodness on all the devices!